Take four palms and remove the hard green edge. This will make it easier to bend and weave the palms. 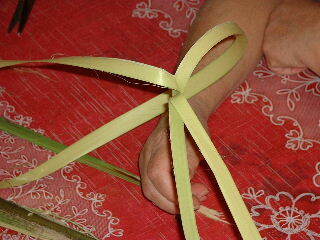 Place the palms together and staple or tape them towards the bottom. Hold the palms in one hand and position one to the right, one to the left, one to the top and one to the bottom.